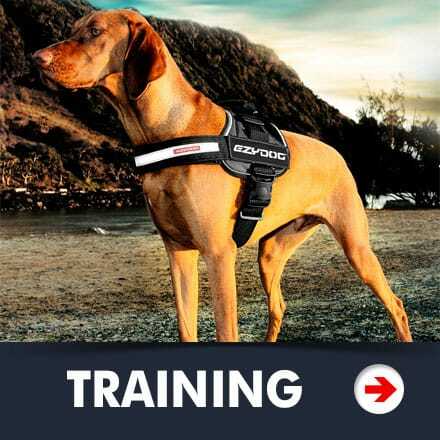 EzyDog provides the training products that you need for your training class, at home sessions with your dog or for professional trainers and their clients. These products are part of a unique collection that will have you covered from treat storage to leashes, collars, even “In-Training” and “Do Not Pet” message badges to maximize your training experiences no matter where you are at. These training products will give you the tools to begin training with confidence. The popular choice for correction training is the Checkmate Collar. This collar is so simple and functional that it takes the fuss out of the “martingale” style of collar. Fit as you would a traditional collar and you are ready to train with the limited slip function to humanely train your dog. EzyDog offers numerous training leashes for different types of training. All of our training leashes ensure a comfortable grip, many offer multi-functions and as always they are built with the high level of durability that you expect from EzyDog. The Convert Harness with Side Labels is the perfect message board to let others know that your dog is “In-Training”. The side labels are available with numerous messages. Maybe your pup is a “Lover” or “Princess” when they are finished with training, but while in training you don’t want them to be distracted with the “Do Not Pet” side label displayed. The labels are easy to interchange with Velcro and the best part is that they attach to one of the most comfortable and easy to fit harnesses available. Treat bags have never before been so cool and easy to use. With many styles to choose from, you can count on magnetized closures, waterproof zippers, reflective properties, plenty of treat pouch space and simple to use designs that are perfect for your lifestyle. With so many options to choose from you can find the training products that best fit you and your dog’s needs. From the seasoned trainer to a complete beginner these leashes are designed to help you get the most out of the time spent during training sessions with your dog.